Details: Homemade pumpkin pie from Mom’s Apple Pie in Sebastopol, California. The beers were good, the pie was awesome, the two together were good. This is the last post in our four-part series about what beer pairs best with Thanksgiving dinner. In the first post we discussed what beer pairs best with turkey, the second post covered what beers pair best with stuffing, and the third post went over what beers pair best with mashed potatoes and gravy. Since we are pairing with the same two beers we’ll skip the beer specific piece and cut right to the food and pairing part of it. You can refer back to the first post about turkey for the specifics on the two beers. The pumpkin pie was awesome. It tasted just like you would expect a homemade pumpkin pie to taste. The pie came from Mom’s Apple Pie in Sebastopol, CA. Between how good it tasted and how much work it is to make a pie myself I don’t see any reason to bake another pie! Picking up a freshly made pumpkin pie was the definitely the way to go. How was the Avant Garde with the pie? The answer is: good. The spices in the pie really added to the flavor and balance of the beer. It was a good subtle enhancement. 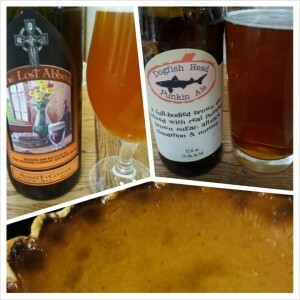 How was the Punkin Ale with the pie? The answer is: great. This pairing really enhanced both the flavors in the pie and the flavors in the ale. The spices seemed to work perfectly together. I was a bit hesitant at first that the pumpkin pie spices would clash with the Pumpkin Ale spices (as they seemed to with the cinnamon apple yams) but that was not the case at all. So, the answer to the original question of what beer pairs best with pumpkin pie is: Pumpkin Ale. You should definitely try to get some Dogfish Head Punkin Ale to pair with your pie but if all you have Biere de Garde that will work rather nicely as well. You know, why limit yourself to one beer, it’s dessert, try them both!